The next time you are stuck in an awkward silence, instead of the weather or some unshockingly shocking tweet by Donald Trump try something optimistic, like child mortality rates. Yes, you read that right. News about child mortality rates is largely optimistic these days. 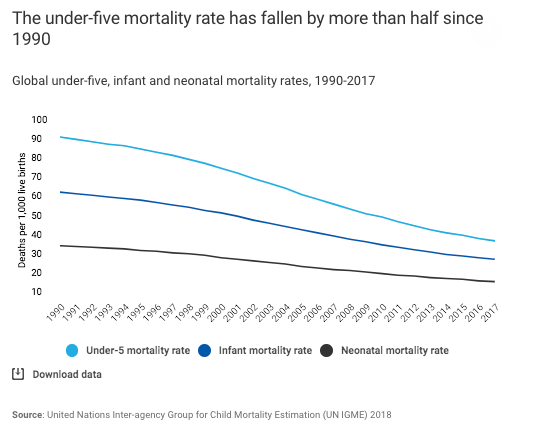 According to The United Nations Children's Fund (UNICEF), the rate of mortality for children under five has been cut by more than half (58 percent) since 1990. And in even better news, the reduction in child deaths has increased from under two percent in 2000 to four percent in 2017. The same report shows that Bangladesh has done a particularly outstanding job at decreasing their child mortality rate by almost 80 percent since 1990. They also have a higher than average annual rate of reduction at 5.5 percent. In October, the World Bank released their human capital index — a measurement of child survival, school enrollment, quality of learning, healthy growth and adult survival to estimate how much of its full potential a generation might reach in each country. When it comes to investing in future generations, at a productivity potential of 48 percent, Bangladesh is doing better than average for its region and is ahead of both India and Pakistan. Although it's better than nothing, this still means that children are likely to reach less than half of their full productivity potential. While child mortality has dropped in the country, many children still suffer stunted growth from inadequate nutrition. To increase their productivity potential, Bangladesh must continue investing in child mortality reduction and increase investment in nutrition and education. The Max Foundation is part of the success in reducing child mortality rates in Bangladesh and is continuing to work to make sure that children are healthy and thriving. After their child, Max, died at 8 months old from a viral infection, Joke and Steven Le Poole decided that they wanted to save as many children’s lives as possible around the world. The couple teamed up with scientists to find out where and how they could habe the most impact and decided on a water, sanitation and hygiene (WASH) and health program in Bangladesh. The Max Foundation notes that while child mortality rates have gone down, they are still too high. So far, the foundation has helped 1.9 million people and aims to help 3 million by 2021. Of those they have reached so far, they have improved access to safe water, sanitation and hygiene. Their preliminary findings suggest a decrease in stunting by 23 percent and they have installed water pipes for over 800 households. Bangladesh shows promise in building future generations, you can spread the optimism and consider donating. Your donation to Max Foundation can help many have better access to clean water, sanitation and hygiene education.